The Legislature asked the Department of Licensing to create a workgroup to examine the use of disabled parking placards and special license plates for persons with disabilities, and develop a strategic plan for ending any abuse. The workgroup is made up of representatives from DOL, Department of Health, City of Seattle, Governor’s Committee on Disability Issues and Employment, and Arc of Washington. The workgroup has been meeting since June to research and review data to determine where potential abuse may be, develop measures to reduce fraudulent use and issuance, and suggest ways to strengthen administrative processes, while minimizing the impact to individuals who really need these privileges. The deadline for public comments is October 15, 2013. The workgroup will report its findings—and a strategic plan on ideas to potentially reduce abuse—to the Legislature by December 1, 2013. The public may share ideas with the workgroup by sending an email to: DPWorkgroup@dol.wa.gov. 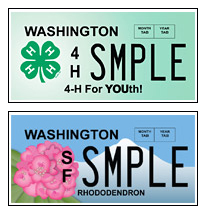 New specialty license plates featuring the 4-H clover and Washington state flower, the rhododendron, are now available. Revenue generated from the sale of specialty plates not only goes to the state, but also goes to organizations associated with each plate. For example, money collected from the sale of the 4-H plate goes toward activities to support the 90,000 Washington boys and girls that participate in 4-H.
And revenue from the state-flower plate generates revenue for garden associations statewide. 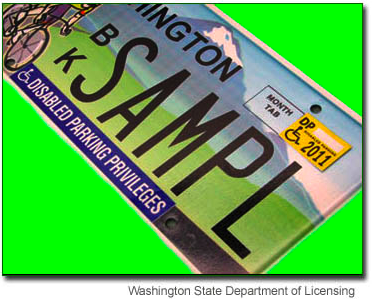 Specialty plates cost $40 more than standard plates; renewal costs $30. 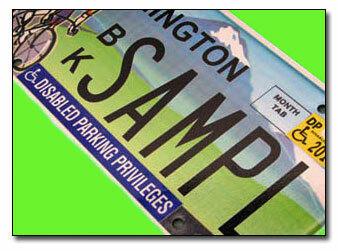 Visit the DOL’s website at the links below to learn how to purchase each specialty plate. On July 1, the Department of Licensing (DOL) will start issuing a redesigned disabled parking privilege license plate tab for use on specialty license plates. This special tab can be used to make most types of specialty license plates function like a regular disabled parking (DP) license plate. They can’t be used on standard issue plates, regular disabled parking plates, rideshare plates, ham radio operator plates or on license plates that do not require annual renewal. In the past, the DP tab was produced using the same color background and text as regular license expiration tabs. The new DP tabs will be produced with a bright yellow background with black text. This will make them much easier to distinguish from standard license tabs. DOL began working on this change following reports that the tab used for this purpose looked too much like a regular tab and wasn’t being recognized as a legitimate DP parking credential by law enforcement, parking attendants or other motorists. Individuals requesting the new yellow disabled parking tab also will receive… (Read more).